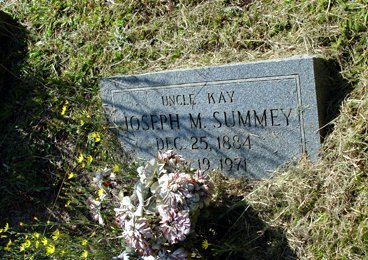 Joseph Marty "Uncle Kay" Summey, son of Lintford Samuel Summey and Artilda "Tilda" Anne Tidwell. Joseph M. (Kay) Summey, of Route 3, Cartersville, died Friday following a lingering illness. Funeral services were held at 2 PM Saturday from the New Macedonia Baptist church with Rev Willie Howell officiating. Interment was in the Old Macedonia Cemetery. Mr. Summey, 87, was a native of Bartow County and was a retired mining employee.